Every month we will be putting a Newsletter onto our website to update all our friends and guests around the globe. 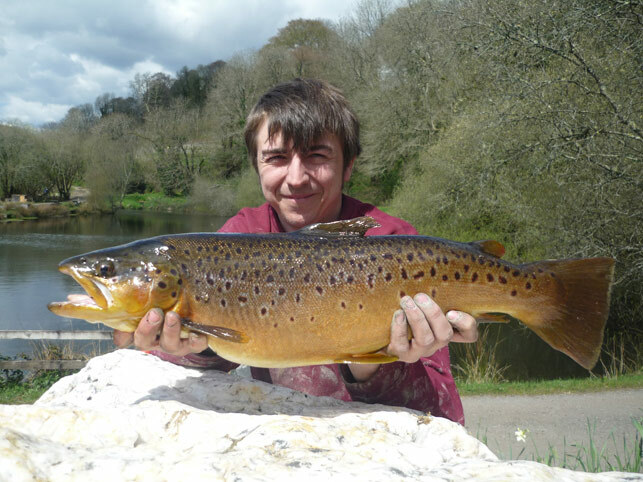 Sam Clarke (photo below) from Plymouth with his lovely 7lb brown trout caught on a dry overcast day in April with an orange lure and a 6lb leader! Well done Sam! As I write this May Newsletter the weather is starting to warm up and anglers are coming out to cast a fly like bees around a honey pot! The buzz is literally amazing! Nothing beats a dry day and a trout on the end of your line and if you are not an angler and you would like to have a go, then do ring me and I will arrange a lesson for you! Even I love casting a fly when I have time and if I manage to catch a trout before Mark, then I am just so happy! April 5th – What a special day to see my little 3 year old come into our bedroom on the morning of her Birthday! Amelia is a little sweetie and she should have gone to nursery on this Friday but it seemed a very cruel thing to do on her birthday when her brother and sister were both on their Easter Holidays; so she put on a pretty dress and opened her presents and had a lovely family day at home! The day finished off perfectly with a first class meal at The Peter Tavy and ice cream all round! April 6th – Saw Mark and Pete erect my new handwashing shed for adults and children to use after they have been exploring my new poultry paddock. Well, the paddock is definitely not complete yet and I just know that this project is going to be a mad rush at the end. I am not at all bothered by this as my late Father used to tell me that I worked best under pressure and so it will be all hands on deck next month and an extra glass of Champagne for me when it’s all finished! 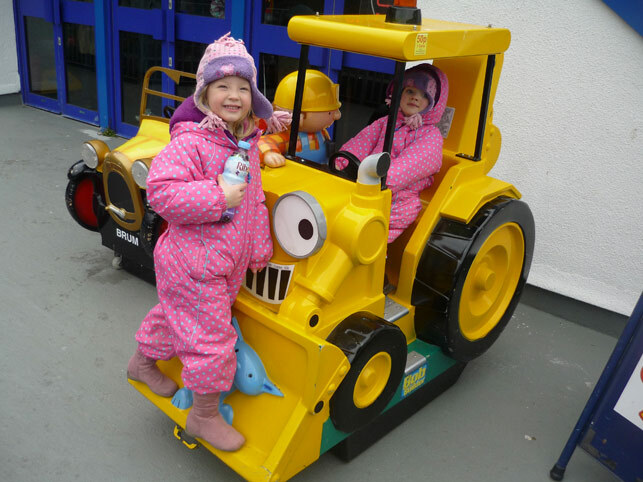 April 7th – We asked Amelia what she wanted to do on the Sunday after her birthday and all she wanted to do was to visit Looe. That’s an easy wish for us to grant as it’s only 45 minutes drive from here and a nice drive too! What do we love about Looe? Well that’s easy to answer. It has two lovely car parks, a smaller one in East Looe and a very large one in West Looe and cafes and shops to amuse everyone but most importantly it has public toilets near to both car parks! Always a very important factor with three children and me on board! April 8th – My brother Mark asked me if I could find some salmon fishing tackle for him to buy and take to Scotland and so I emailed Russell from Snowbee and asked him if he could put a package together and what amazing service I had. Russell phoned me to check my brother’s physique and I told him that there was more meat on a butcher’s pencil and so Russell put together a first class outfit including a rod, reel, line, waders and wading jacket! Snowbee has waders to suit all sizes of anglers, from the very thin chap like my brother,to the fuller bodied person. Thanks Russell, the service you provided us with was second to none! 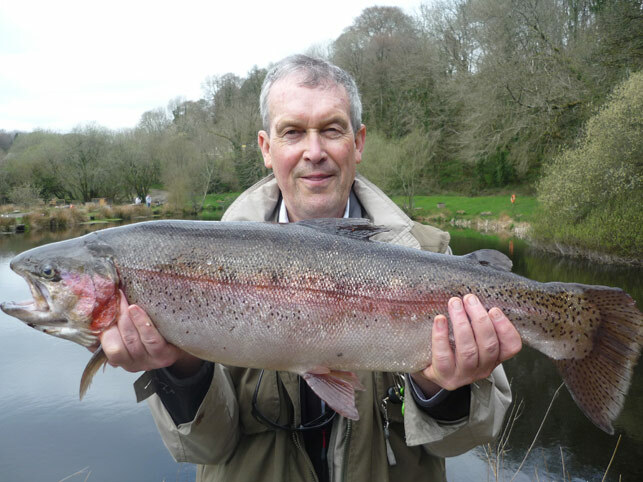 April 10th – A very happy Richard Albones from Dartmouth with his prize catch of a beautiful rainbow of 10lbs-7oz! 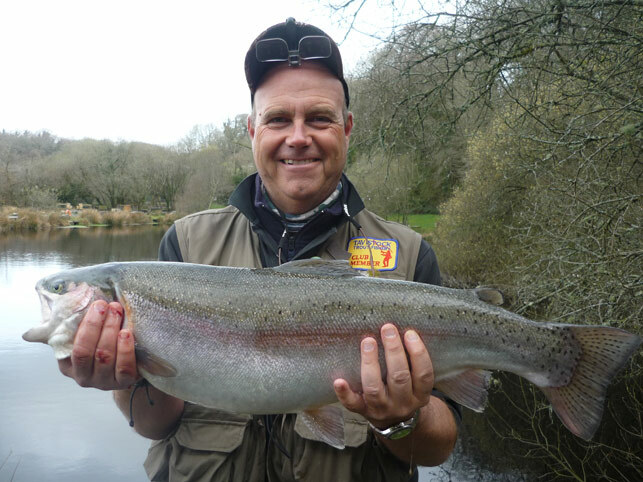 Richard managed to lure this trout with a damsel and a 5lb leader. 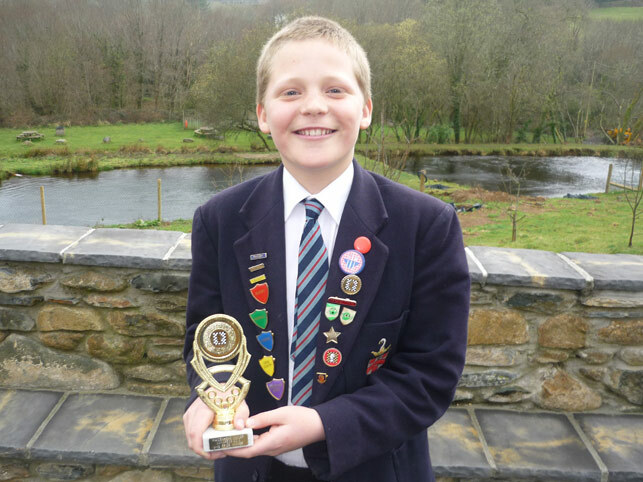 April 11th – Always a very exciting time for any parent is to greet their child after a trip away, and I was very excited to be picking my son, Jack (photo below) from Exeter after his 2 day chess competition in Maidenhead. I couldn’t wait to see him! He was so excited to tell me that he had come third and was only beaten by two children who played for the England team! April 16th – When my children go back to school after a holiday, it’s time to spring clean the house and get back to a sensible routine of work and cooking but with a bit more time in between for myself! The day ended perfectly when Nick Wallis (photo below) landed a fine rainbow of 11lbs-3oz and he continued to land some beautiful rainbow trout of 4lbs and finished off with another rainbow of 6lbs-6oz, all caught on a white fritz catswhisker. Well done Nick! April 17th – Well this certainly was a very special day when I was delighted to offer 14 men (all in re-hab) from 42 CDO a complimentary day to fish my lovely fishery. Gary Champion phoned me a few weeks ago and asked me if I could step in and help out and of course I said yes. These men had a lovely visit and Sarah the owner and organizer from Pentilly Castle, was so impressed that she insisted on paying towards the cost of fishing for their visit. Thanks Sarah! 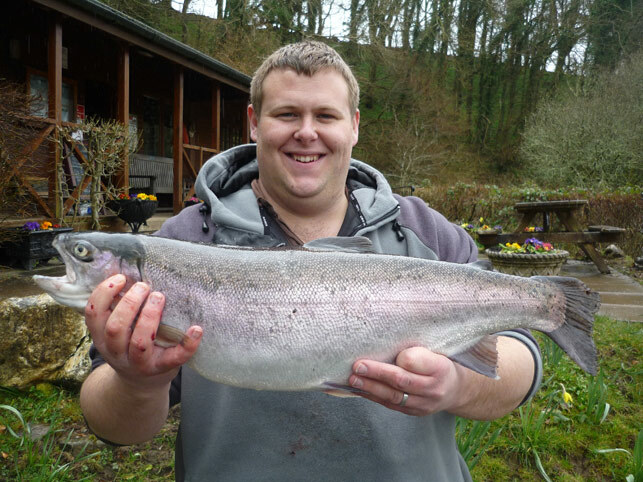 It was a great relief to see Dane (photo below) catch a brace of lovely rainbow trout from our Kingfisher/Heron lakes. The weather was against them but they all did extremely well and showed great sportsmanship. Of course they are all welcome back again, and hopefully the weather will be more settled next time and even more fish will be landed! April 18th – This will go down in history as a very embarrassing day for me when Mount House School phoned to tell me that some of my pigs were in their grounds! I knew this would be some of my pigs and Geri my KuneKune pig as they are a bit mischievous at times! Nigel and I took to the road on our Kawasaki Mule and headed to the school armed with a bucket of pig nuts! I knew as soon as they heard the nuts they would come running and fortunately I was right! They all came at full speed and some of the school teachers were in hysterics. I, on the other hand, was laughing too but I couldn’t get out of there fast enough! Fortunately they followed us all the way home with Ginger Geri bringing up the rear, and of course by the time they got back they were exhausted and slept the rest of the afternoon! April 19th – Oh yes, this turned out to be a night of pure disappointment! Well, the afternoon started out with me having a shower and putting on a dress and make up, something that I tend to do most Friday afternoons after work. Normally I don’t cook on a Friday, as Mark cooks but this Friday I thought I would cook a lovely meal as I was very excited about having a good week! So I set about making a lovely homemade chicken lasagne and put it in the oven and went to pick up my children. The thing I forgot about this afternoon was that Mark had a dentist appointment in Tavistock and oh how I wish I had remembered! Mark was home after I picked my children up from school and he seemed ok but a bit disappointed with what the dentist had told him. It wasn’t until the anaesthetic started to wear off that the mood he was in actually started to surface and in reality he was is pain and in a bad mood with the dentist! He ate nothing for tea and drank plenty of whisky and the sofa ended up being his bed for the night, probably a good job actually! To say I was gutted was a definite understatement and that night I ended up with a brandy, a fine bar of Cadburys Dairy Milk and a bed to myself, not a bad result for any woman! April 25th – Paul Hammer (photo below) from Budleigh Salterton with a lovely rainbow of 13lb-2oz caught with a white damsel and a 6lb leader. April 27th – We set off to our old caravan in Looe for the night and what a lovely night it was too! 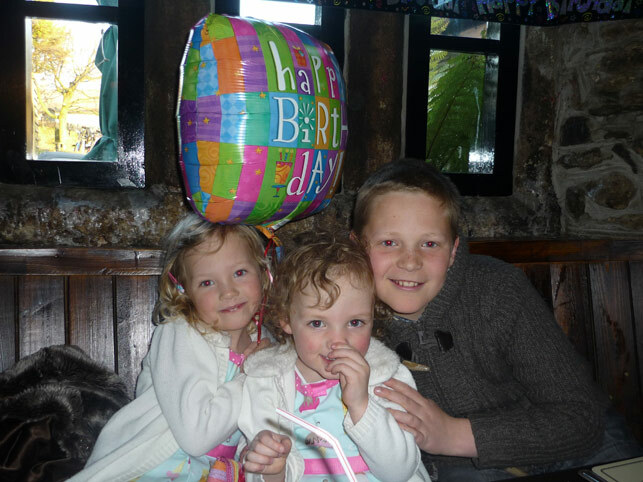 As it was Jack’s Birthday he had the choice of a Chinese or a meal in a pub and he chose the pub. When we arrived at our caravan I poured a large brandy and coke, it was delicious! Our caravan is lovely, a little old and with no working loo, fridge, cooker or running water, it’s more like a camping! Anyway, after a few nibbles we made our way to the Jubilee Pub and had an amazing meal and then back to the caravan for Worzel Gummidge, a wide selection of sweets and a few more drinks! No wonder my children and I love the caravan, Mark on the other hand can’t understand why we leave a perfectly good house to stay in our old caravan! April 30th – Jack’s yearly appointment for an eye test has always been no problem at all and he has never had to wear glasses but this test ended up with a different outcome. We sat in the waiting room and we were called in almost immediately for photographs of his eyes. Before we new it he was having his normal reading the letter tests and then the dreaded moment came when the lady told him that he was short-sighted and needed to wear glasses for school work and TV. A horrible moment for him and then for me as I sat with my two girls and watched the tears stream down his face. It wasn’t long before we stood up to leave and he hugged me in floods of tears and my heart melted as he thought he could not cope with wearing glasses. I fought hard to hold back the tears and reassured him that he would be fine. We went home and he laid on the sofa with a blanket and looked like his heart had been ripped out. – A week later we picked up his glasses and he took them into school for the first day and that night he came home and proudly told me with a smile on his face that his Maths teacher Mrs Buckly told his class ‘That if anyone is rude to Jack about his glasses they will have a yellow slip and I have plenty of them in my cupboard’. Both Jack and his glasses are fine now and my happy, cheerful, bubbly son has returned! Thanks Mrs Buckly! To celebrate the completion of the fishery this June and the fact that I owe so much to my late father, here is another short story about a piece of land that only a handful of people know! Just prior to purchasing our pub The Cottage Inn (that is what it was called then), my late father realised that we needed to purchase the small piece of land between the river Tavy and the pub car park to enable us to erect a vehicular bridge over the river to gain our access to the pub car park. My father found out that the council owned this land and he decided to ask the neighbour that was renting this land if he could buy it on our behalf as we wanted to put a bridge over the river. Dad deliberately never told the neighbour that we were in the process of purchasing the pub, as he knew that if the neighbour knew this he might well want more money. I believe that Dad told the neighbour that he would give him £1,000 for purchasing this small piece of land for us and the neighbour told Dad that he would do it. Several times after Dad struck this deal with the neighbour I asked Dad if the neighbour would try and ask us for more money and Dad insisted that would not happen and that this man was a friend of his. Weeks passed and then Dad arrived and told me that he was meeting the neighbour to discuss the bit of land. I asked Dad if I could go with him to the meeting and his reply was a very firm ‘You can come but you must not say anything’, I agreed to be quiet, not hard considering I was only 22 years old! At the meeting in the field the neighbour told Dad in front of me that he wanted £10,000 for the tiny piece of land! To say my father was shocked and gutted was an understatement and I truly felt his pain and sadness. I still said nothing and just stood by and watched as my father’s words were taken from his mouth. Dad drove me to what was then Safeway and ordered a cream tea for us. He sat in silence and read a paper, of course trying to take his mind of the events that had just unfolded. Dad was leaving for his home the next day and he asked me to pull a better deal off for him and I reassured him that I would do my very best to try and persuade the neighbour to accept less money. In the days after Dad had returned home I went to see the neighbour and told him that we could not afford £10,000 and he still insisted that he wanted it. It took a lot of persuasion on my part to get him to drop the asking price. At last I had a result, I managed to pull a better deal off for my father and we ended up paying £4,000 for the piece of land that we needed to stand our two pads on to support our bridge. Dad was very pleased with me and we both agreed that had the neighbour known about our behind the scenes purchase of The Cottage Inn, now The Trout n Tipple, he would probably have asked for even more money but fortunately he didn’t know until after our purchase of the piece of land from him had all gone through! June Prize! A new prize on offer for the month of June – The largest trout caught from any one of my Osprey lakes will receive a new tackle bag, Lureflash net, Lureflash reel with spools and a TTF bass bag! Wow! So come fishing this June and see if you can tempt one of my large browns or rainbows out of the lake and land yourself a bag of goodies at the same time! June Prize! Another new prize for June – The angler who catches the heaviest bag of three fish from my Kingfisher/Heron Lakes in June will receive a new tackle bag, Lureflash net, Lureflash reel with spools and a TTF bass bag. So why not come fishing this fun month of June and see if you can catch yourself a some fly fishing tackle? 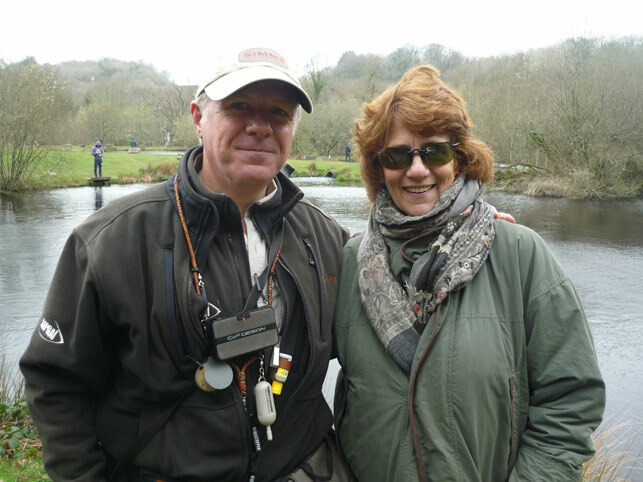 June 16th – Kelly Preparatory School (parents and pupils) visit the fishery for a fly fishing morning and casting demonstration from Tim James. Complimentary refreshments will be provided. June 22nd (Sat) and June 23rd (Sun) – will be another special fly fishing weekend with the heaviest bags over the two days winning prizes. This will again apply to both sets of lakes. 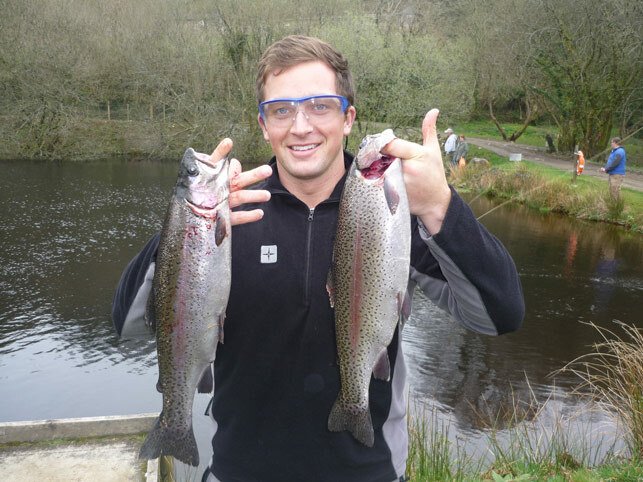 Of course it goes without saying that I will be stocking extra double figure rainbow trout for this weekend! Prizes will be engraved glass tankards for 1st,2nd & 3rd. Free refreshments on both days to all anglers at 1pm and booking is advisable but not essential. 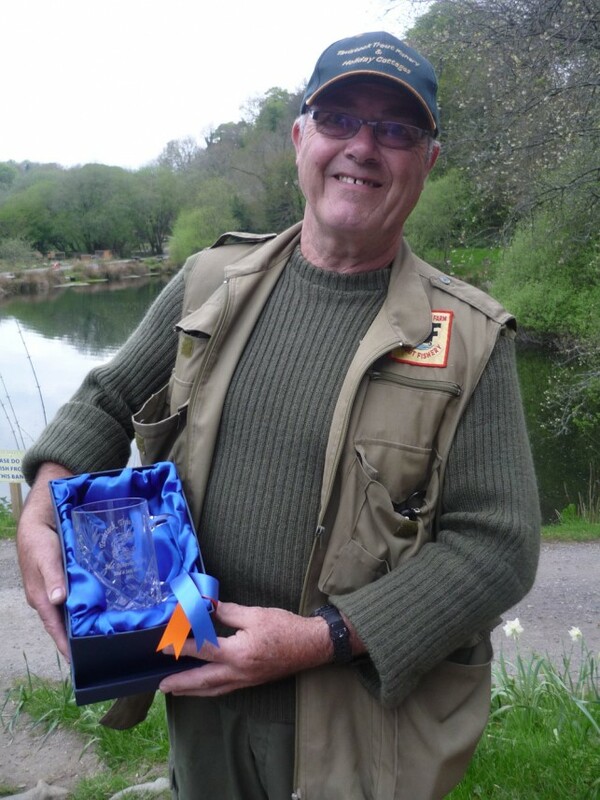 Photo below is Mr P Denman proudly holding his cut glass engraved tankard that he won for coming 2nd on our big fish lake opening weekend! Well done Peter! June 23rd (Sun) – will also be a Special Day with a Fly Casting Demonstration from Gary Champion at 11am. All anglers, non anglers, spectators and children are welcome to come and watch Gary cast a fly line. Refreshments will be provided to all spectators. There will be no charge for this as it is part of our June celebrations! June 30th – This is another special day when those who have worked hard on my cottages and fishery grounds over 24 years will be rewarded with a lovely lunch prepared and cooked by Hungry Hog South West! Beef, pork, sausages and roast potatoes, and I have been assured that all the meats will be from Palmers of Tavistock. Yummy homemade bread rolls and homemade sauces are also being prepared by Hungry Hog SW, it will be amazing! I might make a pudding or two and cook a trout but that will be it for me! Tim James will be demonstrating after lunch how to cast a fly to those of my guests who have never seen an expert on the water! I do hope that you will all join me during this special year for a holiday or a day’s fly fishing to celebrate my 24 years of hard work but of course the weekend of the 22nd and 23rd June will be amazing if you would like to come! As I said the 23rd will be a very special day with Gary Champion casting a line and free refreshments to all who want to come and watch! The time for Gary’s fly casting demonstration will be 11am on Sunday 23rd June, please do call in. A new little twist to my Adult and Children’s Float Fishing Visits that actually open properly at some point in June will be the introduction of our Children’s Art Competition, whereby all children 12 or under will be able to paint or draw a picture while they are here in our Art and Craft Room. The subject for the paintings and drawings will be ‘fish/fishing’. Once they have finished they will put their name and address on the masterpiece and pin it onto one of our notice boards and this will then be entered into our competition to win one of three weekend prizes for a family of 4 people to stay here on the fishery for 3 nights! This competition will close on the 30th September. No cash alternative will be offered and the break must be taken before 1st January 2014. I am please to announce that we now have a local lady who offers a Nanny/babysitting service to guests staying in our cottages. This is a great benefit to those parents that want a bit of time alone while holidaying on this delightful estate in Devon. Her name is Tracy Cazaly, she is CRB checked and up to date. Please let me know if you require further details. I must update you on Fred our visitor from Scotland. He was looked after by a bird specialist for about 10 days and then released back into the wild but the strangest thing of all is that he has been sighted again on the fishery since his release on two separate occasions by Mark and I. Well I say that it’s Fred but of course it might not be and that would actually mean that we have another Osprey on the fishery…Wow! I will try and take a photo of him but I think I will need to buy a new camera first! We hope to install our live web cam in one of our brown trout ponds in July and I will let you know how this project develops. Fingers crossed it works! All visitors to our website are invited this month to enter our free competition to win a 7 night holiday for 4 people! Good luck and I will announce the winner in our next Newsletter! Click here for the competition page. Complimentary locally made cake to all anglers fishing this weekend in our anglers’ tea room! Prize for heaviest three fish caught during this bank holiday weekend from our Osprey Lakes is a Lureflash reel with 3 spare spools and a Tavistock Trout Fishery Bass Bag and prize for the heaviest 3 fish from Kingfisher and Heron Lakes is also a Lureflash reel with spools and a Tavistock Trout Fishery Bass Bag! I will collect the weights from the 3 days and the winners will be notified that week. Please do make sure that you fill your permit in fully on arrival, so that I can contact you if you win. Anglers may enter on one, two or all three days! Good luck and tight lines for the summer season ahead!